Urban density has numerous definitions and methods of measurements, that seek to quantify urban characteristics, such as the total built up area, floor area ratio (FAR), the number of dwelling units, people or jobs within a given area. FAR represents the total area of built floors divided by the given area. Urban sprawl refers to the physical outward expansion of cities characterized by low urban densities. The opponents of urban sprawl argue that it results in increased car dependency, traffic congestion, higher levels of pollution, loss of farmland, duplicative infrastructure costs, limited employment accessibility and concentrated poverty. In the African context the negative effects of urban sprawl are amplified, due to lack of planning and infrastructure provision, while strategies to prevent urban sprawl are inefficient due to lack of enforcement of urban regulation. The cost of infrastructure is area determined and is lower per household in a dense city, as the distances between the buildings are shorter. The horizontal urban development thus requires more infrastructural investments to serve the population, while decreasing cost-effectiveness of implemented infrastructural developments. Urban sprawl cause decreased urban mobility as people need to spend more time on transport due to deconcentrating urban functions. This has wider negative implications in terms of access to jobs and services, and negative impact on the economic development. The houses in the informal settlements of Maputo are almost exclusively single-story and the urban densities are relatively low; approximately 0.3-0.4 FAR in centrally located informal settlements, generally decreasing with the distance to the center and below 0.05 FAR 10 km from the center. The continuing urban sprawl with low urban densities in the periphery of the city decreases the mobility and increases the need for investments in infrastructure while public investments in infrastructure are limited. 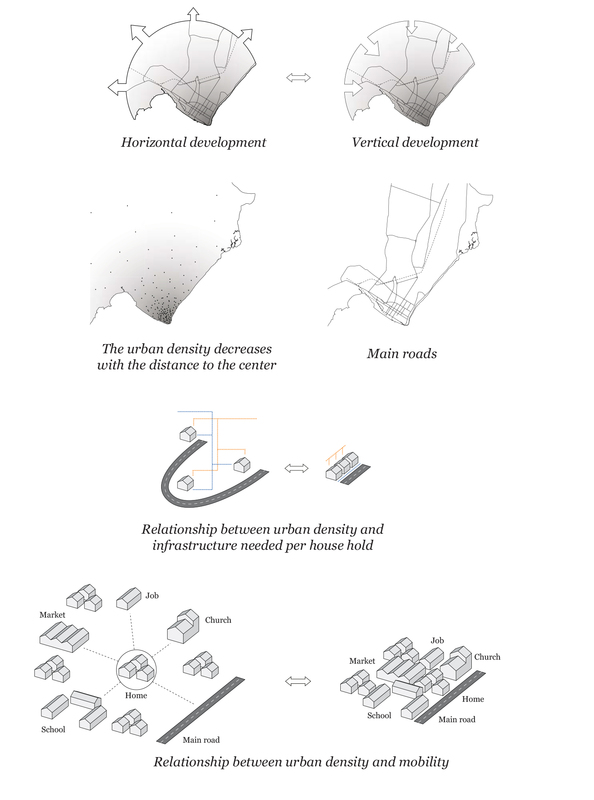 Strategies for countering the extensive urban sprawl by increasing the urban density are thus essential for initiating a more sustainable urban development.